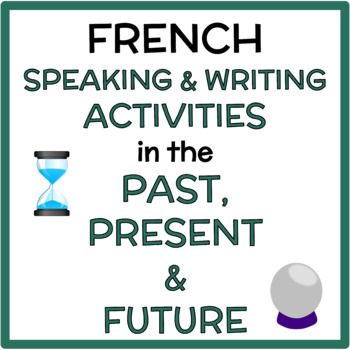 This product centres on 10 core questions in French on the topics of pastimes, preferences, and habits. These questions are asked in the past, present, and future, allowing students to focus on common verbs, interrogatives, and temporal expressions, both orally and in writing. 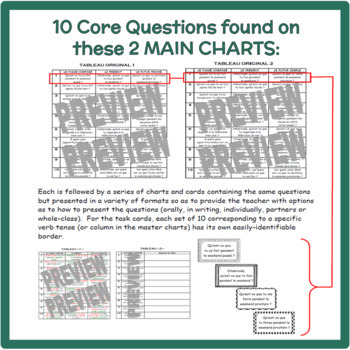 The 10 core questions are found on two main charts. 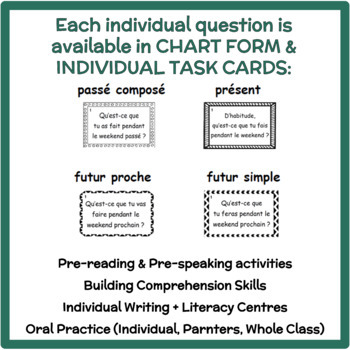 Each main chart is followed by a series of charts and cards containing the same questions but presented in a variety of formats so as to provide the teacher with options as to how to present the questions (orally, in writing, individually, partners or whole-class). For the task cards, each set of 10 corresponding to a specific verb tense (or column in the master charts) has its own easily-identifiable border. Download the PREVIEW pages for a closer view of how the charts and task cards are set up. This product is aligned with the Common European Framework of Reference for Languages, or CEFR (see site Council of Europe: Common European Framework of Reference for Languages).